At least 20 survivors and witnesses of the Grenfell Tower fire have attempted suicide, a charity has said. Silence of Suicide founder Yvette Greenway told the BBC’s Victoria Derbyshire programme the number was based on conversations with those supporting residents. The BBC has been unable to independently verify the figure. Chelsea and Kensington Council has not yet responded to a request for comment. 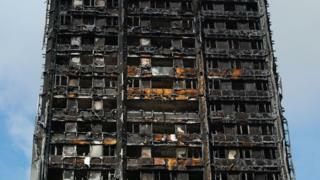 Ms Greenway said many residents were unable to get images of the burning tower “out of their minds”. Ms Greenway said there was little confidence in “council-led” mental health services. “We’ve been told workers are going around putting leaflets under hotel doors and not actually speaking to people,” she said. “There are going to be many more instances of PTSD [post-traumatic stress disorder], depression, anxiety and self-harming as people reach different stages of trauma. “Everybody will be affected at different times. Ms Bolton, a nurse for 20 years who is now co-ordinating volunteers for Justice4Grenfell, said mental health support services needed to be rethought. She said rather than waiting for survivors to actively seek help, services should instead “go to them”. Ms Bolton suggested there were multiple factors in why people were attempting suicide, including depression, survivor guilt and feeling unable to cope with the loss of loved ones. “There just isn’t the proper psychiatric help that people need,” she said. “They need trauma and bereavement counselling urgently. “People are self-medicating to shut out the trauma. “We were flooded with drug dealers praying on the traumatised. “People saw their neighbours falling from a burning building. “They saw children being dropped from the building. “There are still ashes still blowing over us when the train goes past. How Easy Can A Horse Racing System Be And Still Make A Profit?